Believe it or not we are shaped by the things around us and in most cases, the things we choose to surround ourselves with. Some us find energy and reconnect with life through certain elements, such as, air, water, earth and fire. Actually come to think of it, those four basic elements are essential in our lives and it's how we use them that matters, right? This is what Red Water Designs Elements Collection is all about. A beautiful online jewelry store with very unique and stylish pieces. Their Elements Collection consists of bracelets and necklaces that can also be worn as bracelets. They were all designed based on all these four basic elements: Air, Water, Earth and Fire. When I had the opportunity to pick out a bracelet from the Red Water Designs Element Collection, I picked the Fire Element Bracelet - A combination of antique gold tone beads with semi precious beads. I picked this particular bracelet because it is a daily reminder for me that we are all born with fire in us and it is okay to use it by simply finding our purpose in life. While I may look dressed for the occasion, i am not going sailing any time soon. I already found out my purpose in life is not to be a sailor even if i wanted to be one. Boy, I would be terrible at it because water and I do not mix very well together. So I am just going to stick to dry land for now. What isn't there to love about classic stripes? Prints that immediately make one stand out will always be one of my favorites. 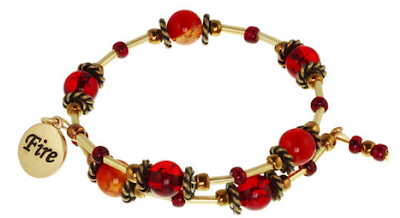 Styling a bracelet with Red Resin beads glass seed beads means giving it its own little limelight. So I used it as my pop of color amidst the black and white mix and match prints and ensemble. love that top and hat. The pants are gorgeous too! Beuatiful look Busola with gorgeous photos! Love this outfit is a nautical chic you look beautiful like a model. I really like your outfit here, the shirt is just adorable and the trousers, too! Very beautiful outfit; I like the stripes; very classic. Love the gorgeous pants, they are always, - for decades now- and I do mean always a favorite. Love how you styled it. the hat is perfect! Love this look Busola, gorgeous! I always tell people that water and I love each other from a distance:-) you look great. And the bracelet is just too stunning! I love the nautical look and your bracelet is great! I love how simple and chic this look is. You nailed it.